The Premiership game between Crusaders and Irish League champions Cliftonville on Saturday has been switched from Seaview to Solitude. The Northern Ireland Football League announced the change of venue on Wednesday night after agreement was reached between the clubs. 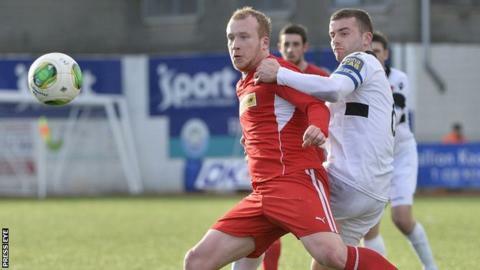 Cliftonville clinched the title on Tuesday, while Crusaders secured third position and a European place. The Gibson Cup will be presented to Cliftonville after the match. "By making this decision, a greater number of fans can now attend the match and celebrate the Premiership trophy presentation," read a statement from the NIFL Premiership Management Committee. A statement released by Cliftonville stated that they had "acceded to a request by Crusaders" to host the final fixture of the season for both clubs at Solitude. Further details about ticket arrangements will be announced on Thursday. Tommy Breslin's side ensured that they retained the league championship by beating Portadown 2-0 at Shamrock Park, while second-placed Linfield faltered at home to Glentoran, losing 2-0. Crusaders defeated Glenavon at Mourneview Park to ensure their passage into European competition next season.